On August 11, 2018 Montgomery-Floyd Regional Library held a celebration honoring Nannie B. Hairston. Here is the full hour-plus recording of the presentation. Want your inbox to tell you what's going on at your library? Sign up for one (or more!) of our branch-specific Announcement Lists. You can now choose between Email, Phone, and TXT notifications for: Due Date Reminders, Overdue Notices, and Available Hold Notices. Visit our Notification page to set your preferences. Ever wonder what happens to old MFRL equipment? It goes up for auction, along with other Montgomery County items. Check back regularly, you may find a bargain! 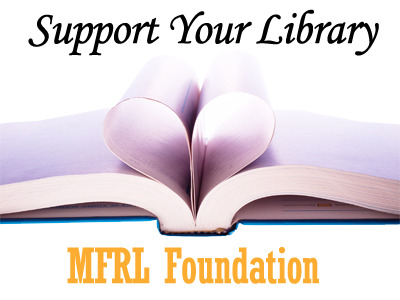 Visit our Foundation Page to see how you can support your library. Library Bills can be paid online. Visit our Bill Payment page for more information. Go to our Reserve a Computer page to make your reservation. Check out the New Books and New Movies recently added to the library collection.